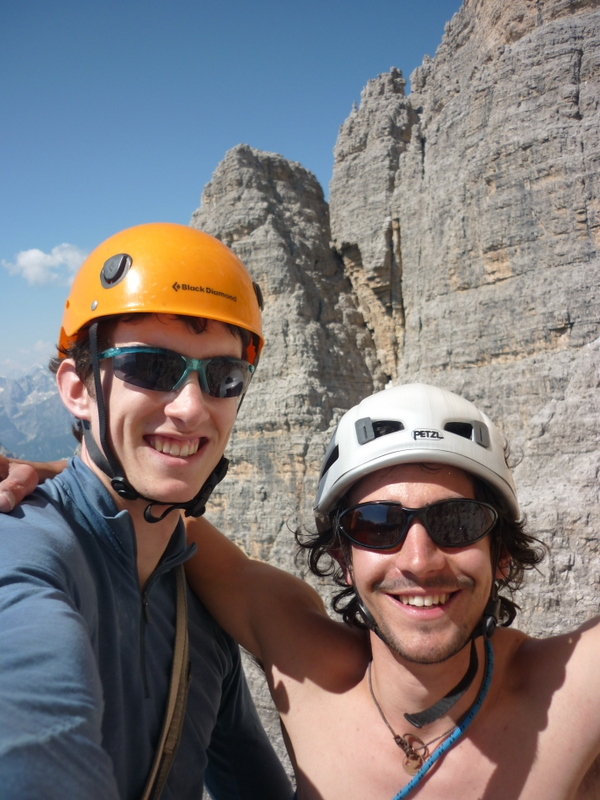 I've just come to the end of a week's climbing trip in the Dolomites. It was my first ever trip to the region. Even though I had seen plenty of photos of the famous Tre Cime towers, gazing up at the imposing north faces was very impressive, and quite intimidating! 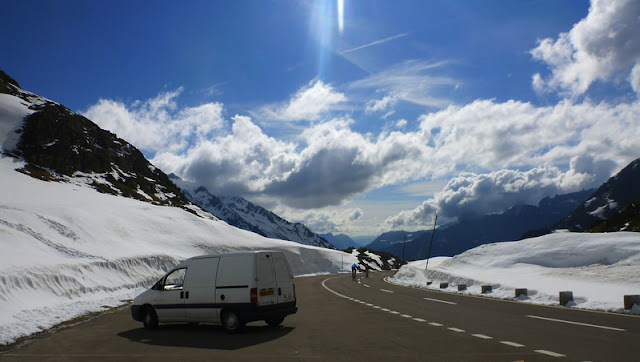 The drive over from Chamonix was 'interesting', following the SatNav on the 'avoid-tolls' setting through the Swiss alps it suddenly announced “turn left and take the ferry” half-way up a mountain pass! 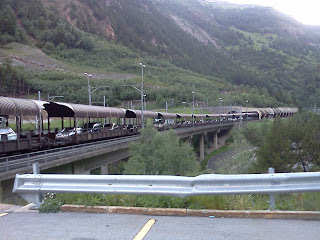 There was no ferry, what the SatNav was referring to was the Valais to Bernese Oberland to the car transporter through the mountain! 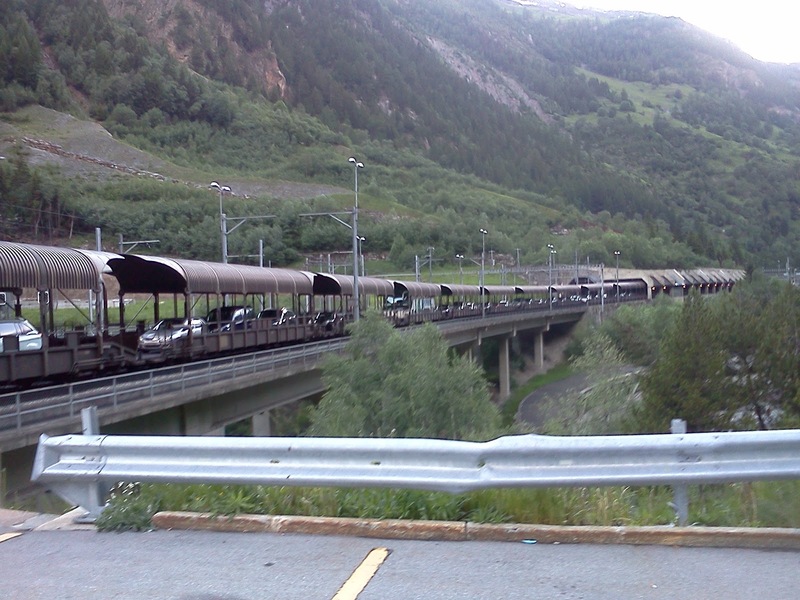 I got in line, paid 22 CHF (18EUR) and drove the van onto an open sided train, this was no tourist affair just a quick and functional service. A bit like the channel tunnel but much less refined, sticking my head out through the van window into the open tunnel while the train was speeding along was quite exciting! After a morning of swimming and climbing in Interlaken we set off for another leg of driving driving east towards Austria and eventually Northern Italy.. Again after following the SatNav up to the stunning Susten mountain pass for several hours it became apparent when we got to a road closed barrier that the pass was yet to open for the season, we were two days two early! It was a bit of waste of an afternoons driving but I can think of worse places to have a late lunch! The closed pass made for the most amazing traffic free ride for road cyclists. We took tolls roads for a bit after this! 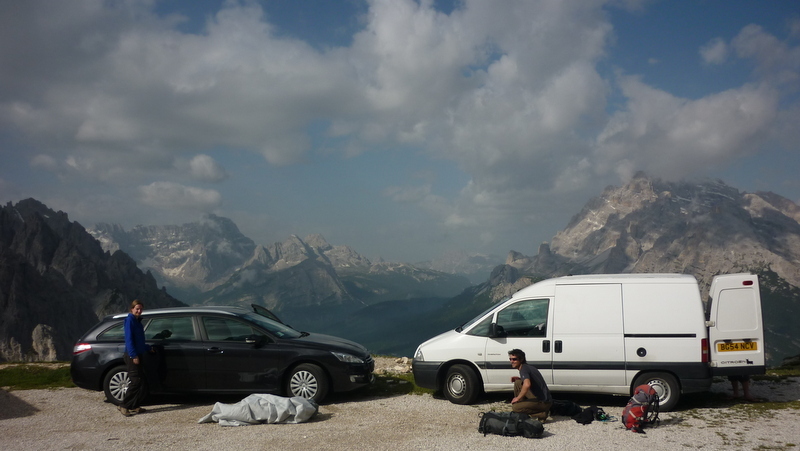 Eventually we reached the Dolomites, we slept in the van in the carpark by the Auronzo Hut up the toll road from Misurina. The toll road cost 22 EUR and 3.50 EUR per nigh to stay up there, quite reasonable to say in such an inspiring place with fast access the the Tre Cime. 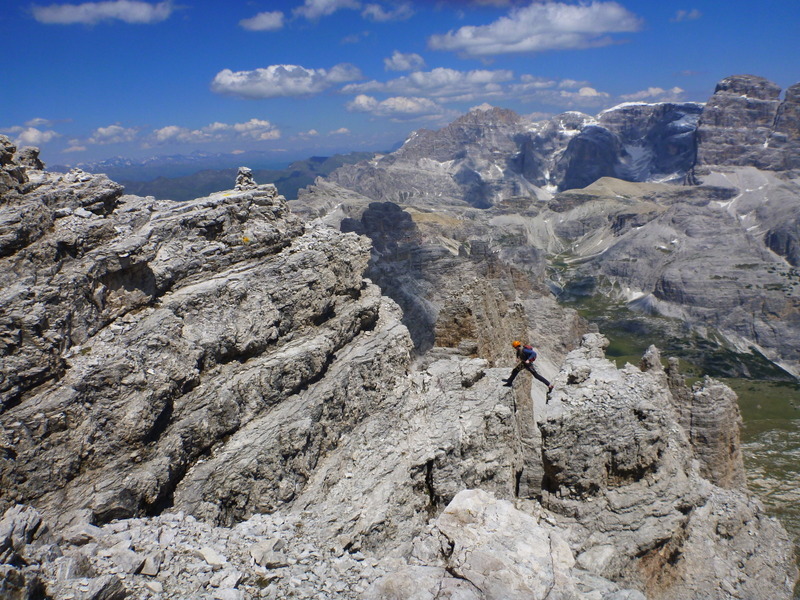 On the first climbing day we climbed Cima Grande, the biggest out of the three Tre Cime at 2998m via the Normal Route. Even though the climbing was very straight forward, the route was complex and interesting. It made for a fantastic if rather long and tiring day out with my girlfriend Amy and friends Chris and Jenny. The Normal Route is also the main descent route on Cima Grande, and since one of my ideas for the trip was to climb the Brandler-Hasse, a 15 pitch route VIII/7a+/E5ish with 730m of climbing on Cima Grande's North Face, having knowledge of this route would be useful. Unfortunately this didn't quite go to plan but it was still a great trip. 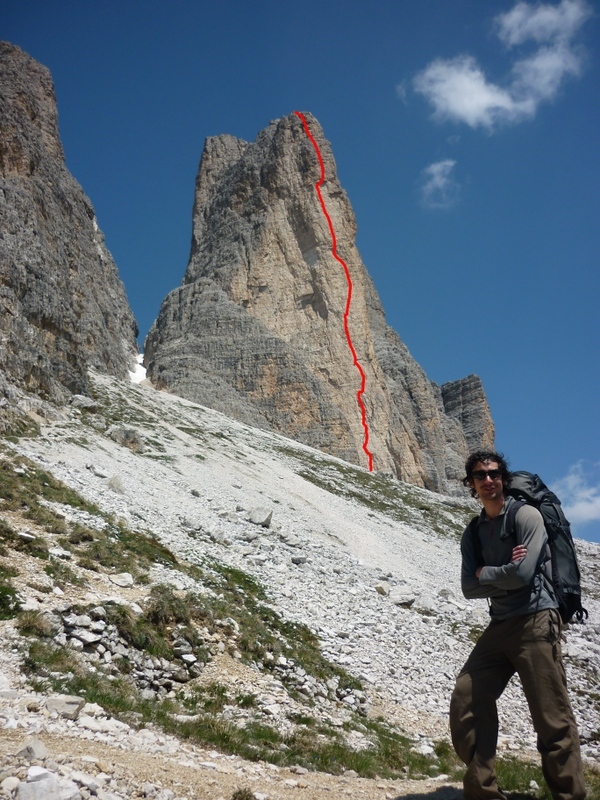 My first big route with Chris was the Gelbe Mauer (Yellow Wall) on the S.Face of Cima Piccola. The route is a modern classic, fully bolted with pitch grades of 7a,7a+,6c,7a+,7a,7a+,6c,6c,6b+,6a+ and 5a! Although the difficulties of this route are more sustained than the Brandler-Hasse, being fully bolted and easily accessible made it a more appealing warm up option. After a 5am coffee at sunrise we managed to knock out the first five pitches, all onsight before the sun hit the face. Seconding the 'warm-up' 7a first pitch! 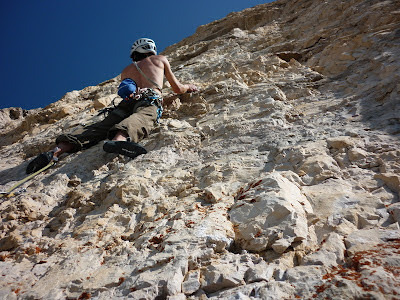 The climbing was excellent, generally technical, often both strenuous and delicate on on small edges. On the 6th pitch which was the last pitch of 7a+ I took a fall when a small flake I was pulling on suddenly gave way! On the whole, the rock on the route was pretty good (for the Dolomites) but care is still needed when choosing holds. Missing out on the onsight of the last hard pitch was a bit of a shame, but at least I've done my bit to make the route have fewer loose holds for subsequent parties! At the beginning of seconding the 7th pitch Chris developed cramp in his fingers and was unable to continue; we descended. It would have been nice to finished the route but we were pretty happy to have climbed most of the best and hardest pitches of this great route onsight. The following day we took a much needed rest-day. In the afternoon there was a massive thunderstorm and a lot of rain. The Brandler-Hasse is on the north face; it's slower to dry after rain than the sunny south faces. 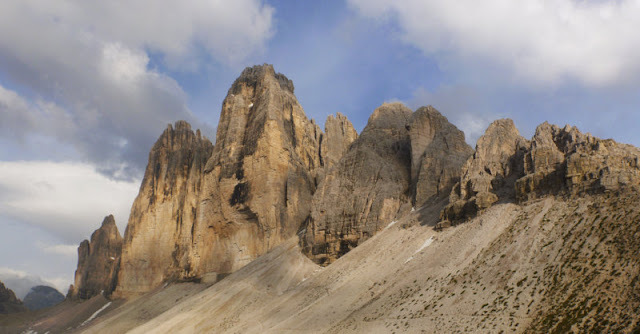 In the evening we wandered round to the north face of Clima Grande to take a look at the conditions, it was obvious the route was totally soaked, we were constantly being showered with drips of water falling from the upper (crux) pitches! The next day was our last full day's climbing, we opted for an easier and quicker drying alternative on Punta Frida's south face. 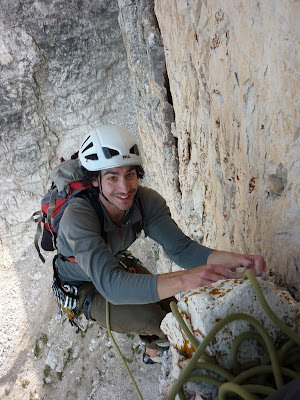 We choose the Via Dei Riocordi, 6 pitchs of VII+/6b+ crux , the route had bolted belays and a few bolts on the crux pitches, a bit of trad gear was needed in between. The route was very enjoyable, we got up and down the route in well under guidebook time. 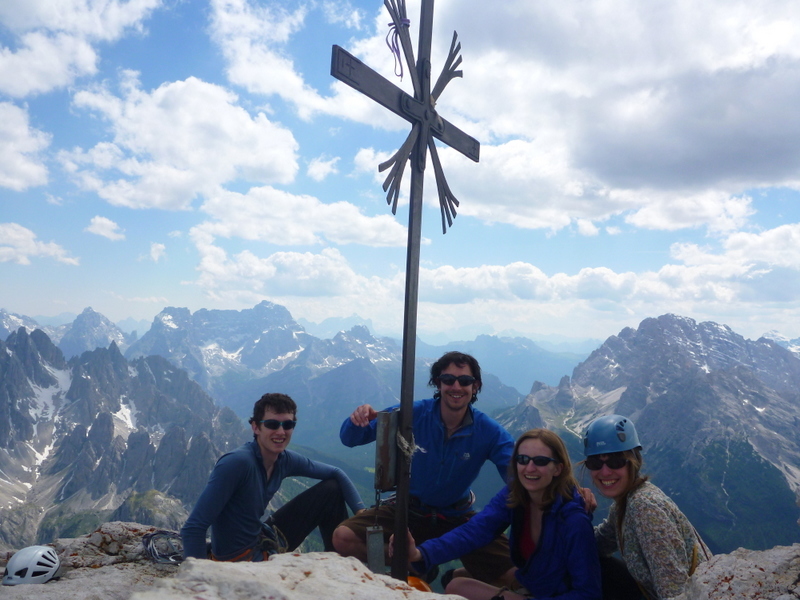 On morning before driving to Arco we all nipped up a via ferate above Cortina. It was a great day out. I love the exposure and the physical nature of the activity and I think it's great how it allows non climbers to experience ascending a big face. However, personally for me it lacks the movements, body positions and immersing problem solving I enjoy so much while climbing. I'm currently in Finale Ligure, yesterday we climbed in the most amazing natural limestone open-air cylindrical cave accessibe via a underground tunnel....this will have to wait till for the next blog post!